As I write this, it’s 6:15 p.m., and I just got home from a walk to the bank. The bank, it should be noted, is at the corner of my block, and yet, by the time I got back home, I was chilled from head to toe. With the current temperature hovering at 15 and a windchill of -1, it’s that kind of day. The low for the evening in Brooklyn is 10 with winds up to 20 miles per hour, and baseball is a far away thought right now. 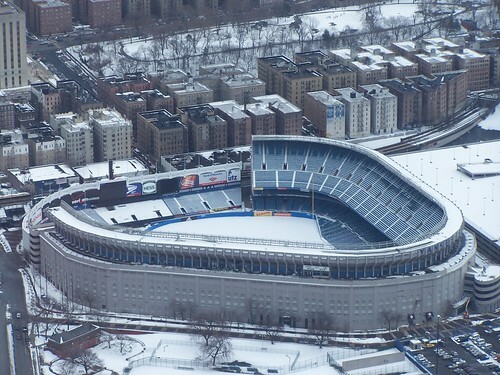 Earlier today, Home Run Derby noted how oddly peaceful baseball stadiums look in the cold. The hulking ballparks are just there, blanketed by snow and silent. A quick run through Flickr gave us the photo above. We can also see the field covered in snow. But in less than a month, pitchers and catchers report. The metaphorical snow on baseball fields around the country will begin to melt, and all will be right in the world again. You know the Open Thread drill. Anything goes. Just play nice. In local action, the Knicks are playing the Wizards, the Rangers are in Chicago (where it’s actually colder than it is in New York) and the Devils are in Columbus.